National Supercomputing Center in Shenzhen - Sugon "nebula"
Sugon "nebula" is a supercomputer exceeding one quadrillion/s computing capacity, with independent intellectual property rights. It is made by Sugon group Tianjin industry base and developed by Sugon information industry (Beijing) limited company, Institute of computing technology of Chinese academy of sciences, and National supercomputing center in Shenzhen, with the support of national "863" plan major projects. It is the first supercomputer exceeding one quadrillion in actual measurement. The system peak three quadrillion times per second (3PFlops), Linpack measured value is up to 1.271 trillion times per second. 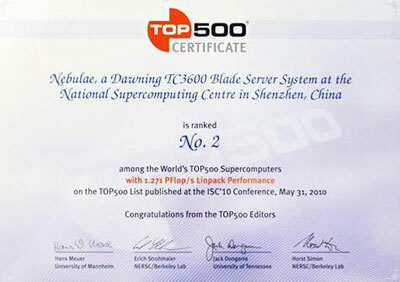 In June 2010, in the 35th world Top 500 rankings of high performance computers, "Nebula" ranked second in the world. It becomes the supercomputer with world's third measured performance exceeding one quadrillion times. Nebula system is the most green supercomputers also, its energy consumption measurement of performance is 480 million times per watt. 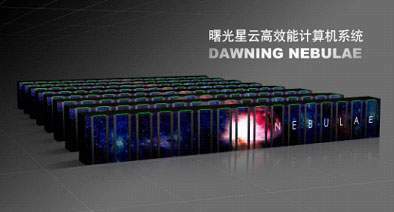 Sugon "nebula", as China's first supercomputer system designed for the future “cloud computing" environmental, emphasizes the equilibrium design and dynamic resource scheduling capabilities of the system. It will become the main machine of a new generation of super cloud computing center. "Nebula" high performance computer system is expected to be installed in the national supercomputing center in Shenzhen at the end of 2010, providing computing service and information service for users in south China, Hong Kong and Macao.